The Feez ice skates for kids are a great pair of training skates for the smallest of skaters. 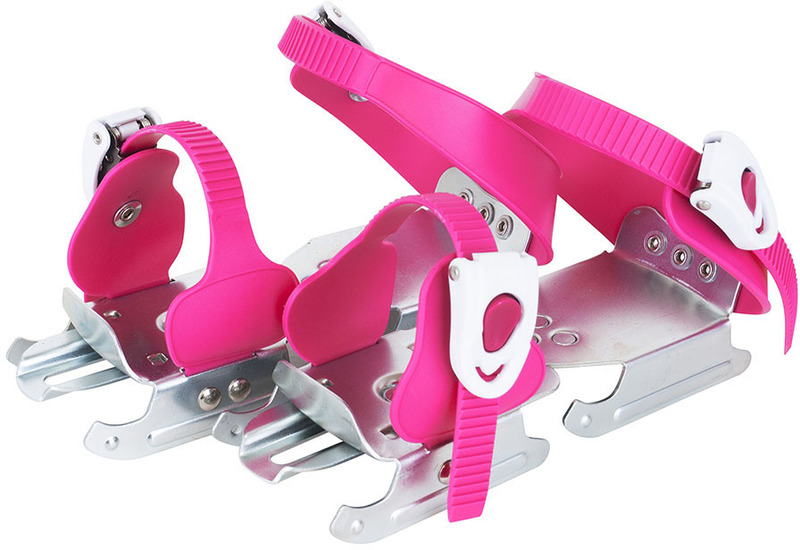 For extra safety, each skate has two blades which ensures that balance is always present. The ice skates are adjustable in length between 14cm (5.5") and 17cm (6.7"). So it will grow with your child's shoe size by simply adjusting it with a screw at the bottom. A pair of buckles on each skate makes them easy to get into. These were perfect for our 2 y/o. Her feet were too small for regular rental skates. She is able to build a lot of confidence on the ice. He also loved being out there and not falling every step! These are good for my toddler who’s just starting to ice skate. I’ve been asked by many parents where I purchased these bc these are hard to find anywhere else. I’m so happy I found these. And shipping was faster than expected. Highly recommend these skates for kids under ~4 yrs. My 2.5yo son has had a blast "skating" around with his older siblings and I don't have a sore back. He can fall and get up all by himself. Easy to put on/take off, seem to be high quality. My 3 years old daughter very happy with her skates. Very quick delivery, fantastic service. Thanks Skate Pro. Easy to use, light weight. Comfortable for kids. Great skates for the beginners.